The forever project - Page 2 - Miata Turbo Forum - Boost cars, acquire cats. It lives!!! I'm pretty sure the sound is the lower timing belt cover rubbing on the timing gear's attachment bolt heads. It'll wear off, right? Last edited by Der_Idiot; 08-10-2013 at 01:54 PM. Yeah, the noise at the end was the lower timing belt cover rubbing on the 36-2 gear's allen head bolts. After a few miles of driving the noise is completely gone. I've also found that the car is impossible to park without power steering; I'll likely be putting it back on in the following weeks. I installed the NB crank sensor over the weekend using Jeremy's install writeup; however they call for a 36-2 wheel, not a 36-1. I took a grinder with a 1" wheel and scored the back of a tooth next to the missing tooth, then broke off the tooth with a pliers, then cleaned it up a bit with the grinder. Extremely quick and easy, I didn't even need to pull the pulley. I advise removing the alternator belt as a precaution though. I then started the car after adjusting the settings for 36-2 configuration and found it was running about 25º retarded. I adjusted the timing reference angle to 65 (as low as it would go) and got to 2-3º ATDC. I ended up setting the sequencer to 137 (each mark is 10* give or take) and reference angle to 87. This resulted in a DEAD ON 10º advance, very little fluctuation compared to using just a CAS. I have my idle set at 10-12*, 900rpm and roughly 14.3:1 afr. IAC is at 35% and intake idle temps are at 160 at idle. I need to find out a way to get this upper coolant hose off my intake hose, my IAT shouldn't be that high, should it? I have found however, that upon driving it last night the car seemed... sluggish. Like it lost power from this change. I ran some logs but nothing looks out of place so I'm at a loss. Today as I was going to lunch and noticed my idle vacuum is 12-14inches instead of the usual 18 or so. I looked over the engine bay and found no vacuum leaks. I did adjust my idle speed from 1000 or so to 890, wondering if that's what brought this on. I'm going to check compression on the motor nevertheless as a precaution. Hoping I didn't damage something while it was running at 20-25* retarded. It was only for a few minutes and completely idle, but who knows.. Resolved; I had reverted a setting on a map on the ECU and it also reverted some trigger settings. I'm seriously considering a swap to a MS3pro after talking to Emilio. The Hydra is nice if you know what you're doing, but most of the tuners I talk to don't want to touch it..
What exactly would I need to replace from my FM2 kit to swap to a MS3pro? Can I use the same knock, wb02 and air temp sensors? I'd like to build in an EGT sensor, if for nothing else than to kill the engine in extreme rich situations. Last edited by Der_Idiot; 08-21-2013 at 11:57 AM. Car overheated yesterday, the radiator fans weren't switching on. I was luckily close to home and put a box fan on the radiator support and leaned it against the hood prop to cool the engine. Either a fuse or the temp sensor since the relay clicks when I ground TFAN in the diagnostic box. In other news, I'm looking into getting a few new gauges: AFR/EGT, Oil/Water temp, and I already have the FM boost/vac gauge so I can hold off on that. My big one though is AFR/EGT. Should I get digital or stick with mechanical gauges? I am happy with the Zeitronix combo. Had to replace the EGT probe, but you can get non-Zeitronix ones pretty cheap. The Wideband has been operating since installed 8~9 years ago. I've pretty much settled on VEI gauges. I can get all 3 gauges, a EGT probe, water/oil sensors and a vac/boost sensor for a relatively reasonable $430+s&h. Pretty sure the Hydra can output a 0-5v linear curve for the AFR signal. I really want to wire in the EGT probe to the hydra so it kills the car if EGT peaks above a certain temperature (not sure how high, 1800? Can the inconel valves handle that?) but I'm not sure it can do that. They'll all be red gauges and I'll replace the light covers in the factory cluster with red ones. I'm thinking it'll look pretty good. Had the car on the dyno Monday to get some of my fueling issues corrected. We fixed the fueling and adjusted AFR targets to get more fuel economy (15.6:1 cruise AFR and more clear transitions into boost). We tried to get my janky MBC working but it doesn't seem to work very well, I would have very unstable boost and it fluctuates a lot and sometimes overshooting significantly. At present I have the MBC on and set to ~14psi to keep the WGA closed until the last minute and aid spooling. I'm hoping I can find an EBC to work with the hydra, though. I tried setting up my Ingersoll-Rand EBC tonight but I think the solenoid is a dud now. I set min/max PID% to 100% and set the cutoff RPM to 0; should it not make some sort of noise from the solenoid? Top was installed last Fall, less than 1 oil change on it. That was my sister, lol. Wondering if this would fall under renters insurance or car insurance? I think I'll be parking indoors from now on. Depends on your coverage i'm sure... Did they get anything from in the car? I don't know whether your car was locked or not, but you NEVER lock a convertible. The corollary to the above is that you don't keep anything important inside a convertible. Of course, if it's just random vandalism, you're SOL anyway. All they got was the faceplate to the deck. Didn't even try to steal the deck. Doors were unlocked. I guess thieves don't even consider the possibility that the car could be unlocked (sigh). I'm getting ready to pull my radio altogether along with the door speakers. Never use them. One less thing. 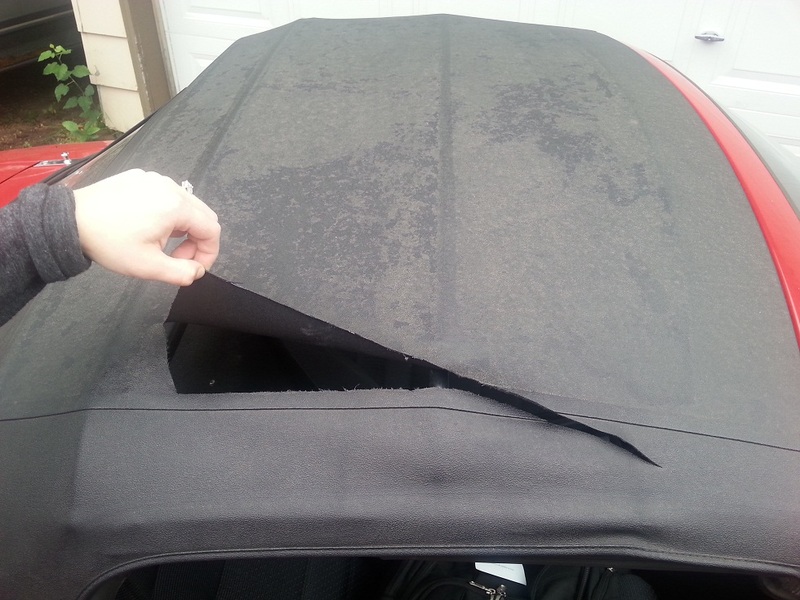 Update on the car situation; car is currently parked with duct tape sealing the top. I'm not sure what I'm going to do about that. As I don't have a charger for my laptop I can't tune the car and I haven't been motivated to drive it because everytime I see the cut in the top I get pissed off. Bummer about that top man. Could you post more details and pics if possible of how you ducted or "boxed in" your radiator and intercooler. I'm trying to figure out the best way to do something similar soon. Seriously man, get over it. If this is the worst thing that ever happens to you, you're darn lucky. Just read a story about a 5 year old being gang-raped in Pakistan. Think about that! Miata tops are cheap and easy to install (E-bay works fine). As for your laptop, get a charger or newer laptop and start tuning. This is the best time of the year to be driving the Miata with the top down. Brace yourself. Top down Miata season is coming.